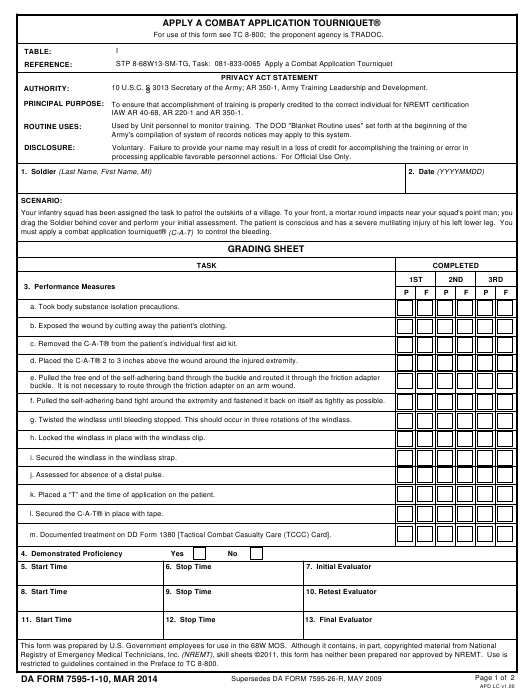 DA Form 7595-1-10 or the "Apply A Combat Application Tourniquet" is a Department of the Army-issued form used by and within the United States Military. The form - often incorrectly referred to as the DD form 7595-1-10 - was last revised on March 1, 2014. Download an up-to-date fillable DA Form 7595-1-10 down below in PDF-format or look it up on the Army Publishing Directorate website. b. Exposed the wound by cutting away the patient's clothing. c. Removed the C-A-T® from the patient’s individual first aid kit. d. Placed the C-A-T® 2 to 3 inches above the wound around the injured extremity. buckle. It is not necessary to route through the friction adapter on an arm wound. f. Pulled the self-adhering band tight around the extremity and fastened it back on itself as tightly as possible. g. Twisted the windlass until bleeding stopped. This should occur in three rotations of the windlass. h. Locked the windlass in place with the windlass clip. i. Secured the windlass in the windlass strap. j. Assessed for absence of a distal pulse. k. Placed a “T” and the time of application on the patient. l. Secured the C-A-T® in place with tape. m. Documented treatment on DD Form 1380 [Tactical Combat Casualty Care (TCCC) Card].